Now, Lily has it all—love, passion, a family, and the career of her dreams—with Christopher. But something is lacking. She and Donovan have spent the last ten years living apart, and the soul mates are eager to reunite. Can Donovan keep his promise to give Lily all she desires, even with Christopher in the way? Donovan is convinced Lily has been his love for all eternity. Determined to unravel the past, they embark on a journey to discover where it all began. For centuries Donovan has stolen Lily’s heart while forced to suffer for his love. How much can a soul endure before the breaking point is reached and a monster emerges? Can the demons of the past be combated to pave the way for happiness in the next life? Or has the abuse suffered in this life already turned Donovan hell bound? Time and again, one woman has destroyed their happiness. It’s time to silence her—once and for all. 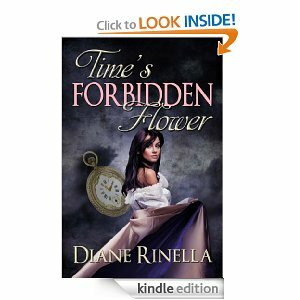 Ravishingly sinful, witty, and controversial, Time’s Forbidden Flower, the sequel to Love’s Forbidden Flower, is a barrier breaking love story of time unwound. It is with great pride and some sadness that I review this final book of Lily and Donovan’s story. I have had the privilege of watching them as young teenagers struggling with a mutual attraction, to their early youth of being separated, to reuniting along with their spouses and children to the final years of their life. I have cried with them, been angry for them, laughed with them and even though the series is over, I will carry them with me. Yes I sound like they are living human beings, but that is the way this author writes them. They do become real and they make you fall in love with them and want to fight for their right to love each other. Lily who is now married to a husband that is carrying a lot of his own baggage from the years they were apart tries to be the best husband he knows how to be. With two children and dream jobs that they are trying to maintain, they go through life with questions and struggles, but always loving each other. Even though she does love her husband, her love for her brother never ceases, not matter how hard she tries to repress it. She struggles to live as society determines she must, but each day a small part of her heart breaks because she knows it belongs to her brother. Donovan, married now to a woman who has her own mental issues and a child they produced, tries to love his wife and do right by her while trying to move on from the past abuse he suffered at the hands of “professionals” who were trying to conform him. He protects her and his daughter no matter what his wife is doing at that time. He understands being thrown away because of issues that society doesn’t see as normal, so he works very hard to help heal his wife, while still being in love with his sister. While trying to make up to Lily for the past hurts he caused in her life, he tries to keep a certain distance from her. Finding this difficult to be apart yet still be the big brother she needs and the Uncle to her children, he struggles to find an acceptable balance, even with the nagging in his heart that Lily should belong to him. Through death of loved ones, lies exposed, DNA testing, questions answered in everyone’s lives, their family begins to grow and peace starts to enter again, but then a OMG moment happens that will take your breath away. Diane wrote an ending that seriously made me gasp out loud and yell. Never did I expect that twist in the story, but it made all the sense in the world once I was over the shock. This is the first book that I have read that actually had an ending, there was no wondering what happen to the characters. We were introduced to them from the beginning and had the honor to being with them till the end. I have had the great pleasure of telling others about this series and explaining the story to them. We should start investing in the belief that real love and happiness should be allowed for all, not just those society deems as morally correct. That liberty and equal rights are to be for ALL, not a selected few. By developing characters that you can’t help but fall in love with, the reader is forced to look at the concept of freedom to love. I have Lily and Donovan so entwined in my heart, there is no way I could look at them and tell them they must suffer the rest of their life and be away from the one they love just so they won’t make society uncomfortable, or worse yet, threaten traditional marriage. I for one, do not feel my traditional marriage is threatened by two other people who take an unusual path to finding happiness and love and that is what I hope everyone gets from this series. In the book you will see how they tried not to draw attention to their situation, they just wanted to live their lives. To see the pain society inflicted on Lily and Donovan, whose only crime was not living as everyone else, and then in the final book to see the happiness when they were finally free to be happy in their own skin and make their own choices. The sad part still remains a fact, society stole so many years from them and those years could never be given back. Diane proves the theory that life is stranger than fiction sometimes. She gave us a book that is based on real couples, and we can see there is no threat in allowing others the right to find love and happiness. Thank you Diane for bringing attention to this with Lily and Donovan. They will forever remain in my heart.